Breezie is a daughter of Ellie and Ranger and a gorgeous tri color with a smooth straight shiny easy care coat. She is easy going, very bright, loves a good game of fetch, and loves a race with her sister Bergie. Breezie has longer legs than Bergie and is always just a little bit faster than her. She keeps the pond free of geese and herons and learned this from her mother Ellie. Breezie is Tom’s riding buddy and enjoys her visits with many carpenters who save her parts of their lunch.. She loves all people and is friendly to all dogs. She knows the names of her dog buddies, her horses, Tom and I and also “grandpa”, who gives her biscuits when she visits him. She is always on the alert especially after dark. She loves fishing with all fisherman and will ride with anyone taking the paddle boat on the pond. 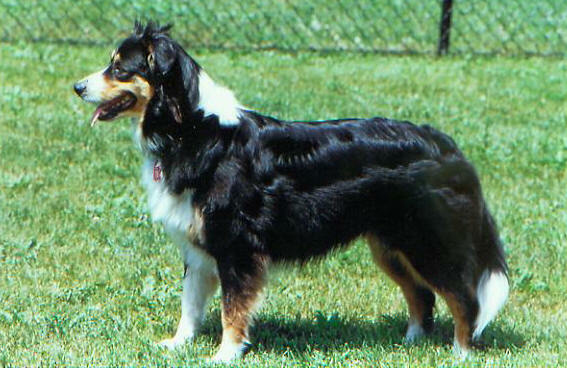 Breezie produced a wonderful litter of ten puppies with Knox’s Strider du Prairie in Nov of 06. At one year of age, five of the six females are in homes with livestock, and working.